One of the biggest problems Brooklyn Nine-Nine has had in its second season is a sense of stagnation, even with the brief moments of change where characters momentarily grow or create new character dynamics. Part of that is the wear and tear of the 23-episode season, which has made a lot of the episodes feel like stalling tactics, especially past the Giggle Pig arc. It doesn’t help that these last few episodes of the season are clearly the ones that “really” matter, as bleak as that sounds. As the penultimate episode of season two, “The Chopper” clearly ends up mostly being the set up for the finale, but it’s still a very solid episode with a good A-plot. In fact, you could even call the A-plot “epic,” just like the case Jake brings to the precinct’s attention. After the death of Carl Mather, one-fourth of the Fulton Street Four, Jake jumps to the (correct) conclusion that one of the Four is killing off the others to keep the $21 million they stole all for himself. It’s a major case, and because of that, Holt assumes Chief Wuntch and her “little rat claws” will transfer the case over to Major Crimes—which is why Holt continues to harp on it (assuming it’s a case they’re doomed to fail) as soon as Wuntch gives the 9-9 the case, with her full support and whatever resources they could possibly need. This candid confession from Holt to Jake makes it all the more crushing when it turns out that sending Holt back to that hellscape (as the head of Public Relations) was Wuntch’s plan from the very start. 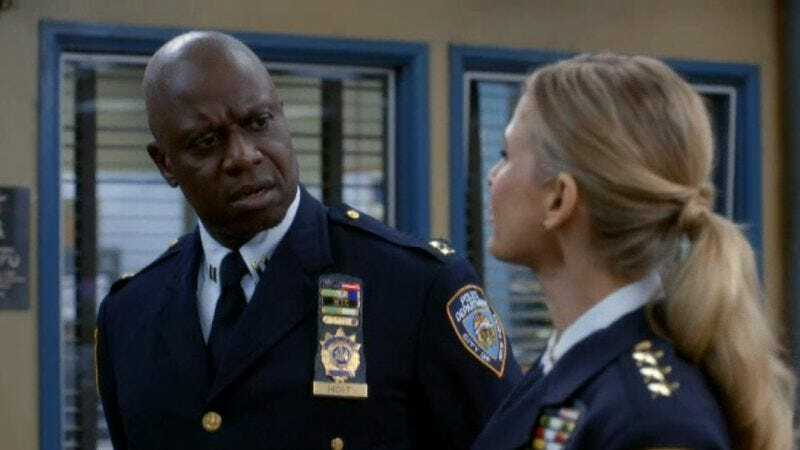 The episode ends with a miserable Holt, in shock, and continues the second season of Brooklyn Nine-Nine’s undercurrent of sadness as it heads into its season finale. While Terry possibly leaving the 9-9 was dangled and immediately taken off the table in last week’s “Det. Dave Majors,” “The Chopper” basically goes forward with a better executed version of that concept. As ridiculous as it is, Jake, Boyle, and Holt leaving the chopper in slow motion as “Ante Up” blasts on the soundtrack is pretty damn cool. No, Jake doesn’t have a knife between his teeth, and he’s not carrying any machine guns, but he is “Deathblade,” and that’s all that really matters. —because whenever a show treat twins as though they’re literally the same person, it’s hard not to laugh. “The Chopper” gets the job done when it comes to setting up the finale, which isn’t always the case with penultimate episode. Hopefully it’s an epic ending to the season. 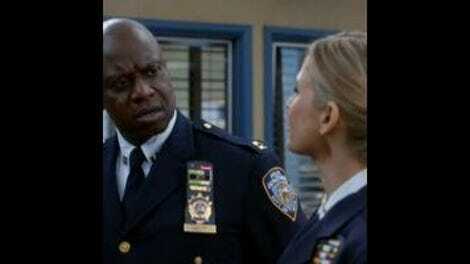 This week in webisodes Brooklyn Nine-Nine needs: This week, there is no webisode. Instead I have a group poll. Which is a better memoir title? Go Ahead: Jake My Day or Case Closed, Jake Open. Good to see Boyle got out of selfie mode to take a picture of Jake with the mountain of money at the end.